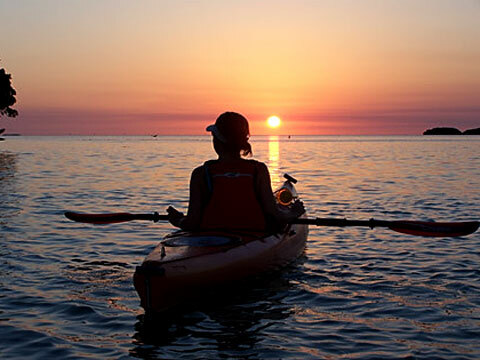 KAYAK THE FLORIDA KEYS WITH BACKCOUNTRY COWBOY OUTFITTERS Guided kayak nature tours, kayak rentals or Sunset Kayaking. All great individual or family adventures. Opening September 2004, Backcountry Cowboy Outfitters is a unique, specialty retail store that serves the needs of outdoor enthusiasts in the Florida Keys and South Florida. You'll find everything you need for your Kayaking, Camping, and Outdoor Adventure needs. We'd be glad to assist you, your family or your group in getting the most out of your trip to the beautiful Florida Keys, Everglades National Park or Dry Tortugas National Park. Contact us for assistance or stop by our retail store, located in Islamorada on US 1 @ mile marker 82.2. NO PRIOR EXPERIENCE IS NEEDED to enjoy kayaking. Islamorada offers some of the most beautiful waters in the Florida Keys. Nearby, paddlers can easily spend several days enjoying the turqouise waters of either the Atlantic Ocean or the Florida Bay (Gulf of Mexico). Locally, several State Parks are only a few strokes away. Indian Key S.P., Lignumvitae Key Botanical S.P., Shell Key and Long Key S.P. all offer great paddling destinations along with a rich local history dating back to the early 1800's. Whether it's relaxation or soft adventure you are looking for, consider spending some time with us paddling through the mangroves and taking in the sunset on a guided kayak tour. Kayaking the Florida Keys is a great way to observe our local ecology while experiencing things you wouldn't ordinarily see otherwise. The staff at Backcountry Cowboy Outfitters can help answer questions you may have regarding paddling destinations, kayaks, and gear, and even offer local advice to make your paddling here in the Florida Keys the most memorable possible. Coming Fall '07, Backcountry Cowboy Outfitters is 'invading' the Everglades by kayak and we want you to join us! By customer demand, we've decided to launch Adventure trips and Day trips into Everglades National Park. As an Everglades National Park authorized tour company, we'll offer first quality, 'once in a lifetime trips' that will be the talk of your family reunions, office co-workers and neighbors alike. Our trip offerings will include a few different length options. We hope to be able to offer a trip that will fit the majority of our paddlers needs. ADVENTURE TRIPS (OVERNIGHTS, MID NOVEMBER - APRIL) SKILL LEVEL: MODERATE TO EXPERIENCED Within Everglades National Park, there is an inland water route that consists of almost 100 miles from the northwest corner of Everglades National Park (Everglades City, FL) to the very southern tip of the Florida peninsula (Flamingo), that waterway is called the 'Wilderness Waterway'. Our adventure trips will range from a 3 day/2 night to a full 'Wilderness Waterway' trip of 6 day/5 nights. With over 40 different campsites, and countless potential of natural encounters, Everglades National Park is a paddler's dream destination. We'll decide as a group, what type of sites are preferred (Chickee, Ground or Beach sites) and try to build the route around your desires. What's included All of our adventure trip pricing will include the following: ENP camping permits, kayaks, paddles (graphite), PFD's (life vests), tents, ground mattresses, camp stoves/fuel, headlamps/lighting, ENP charts, dry bags/boxes, some group meals, safety equipment and of course, your guide service.